On January 31, 2019, His Holiness Patriarch Mor Ignatius Aphrem II met His Excellency Dr. Riyad Sneih, Ambassador of Syria to Egypt. 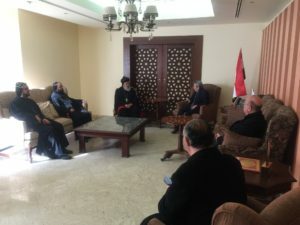 His Holiness was accompanied by His Eminence Mor Timotheos Matta Al-Khoury, Patriarchal Vicar in the Patriarchal Archdiocese of Damascus and in Egypt, Very Rev. Raban Joseph Bali, Patriarchal Secretary and Media Office Director, and Very Rev. Raban Philippos Issa, Parish Priest of St. Mary Church in Cairo. His Excellency welcomed His Holiness and the accompanying delegation. His Holiness and His Excellency spoke about the ancient cultures, and the role of the Church in the building of societies and individuals.